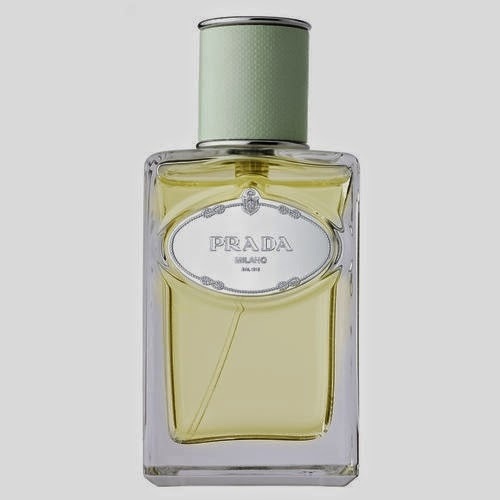 Prada Infusion d'Iris eau de parfum is a real steel magnolia of a perfume. It's tender, even yielding as it works its way into an ample dust bunny of musk and iris. But unlike most fragrances, it doesn't seem to subside once it reaches its crescendo. Or in this case, "crescendo-o-o-ooooooooooooooooo", as Infusion d'Iris's hazy clouds of powder and sentiment billow from the skin in a long-echoing, muffled boom. It may smell soft, but it's sure as hell emphatic. And the signature of this Daniela Andrier creation is so distinctive that it's immediately recognizable, no matter who's wearing it, no matter how small the spritz. Infusion d'Iris's dynamic of loud softness calls to mind Kenzo Flower and Chloé 'Love, Chloé, two other perfumes that successfully whip up a souffle of static electricity and femininity around an unbreakable metal spine. Well, you certainly know how to perk up my interest, Hessa - "honey & incense to the max"? I can't wait to smell it now! Wow, Monica! I love the head trip Infusion d'Iris takes you on. It turns you into Shelly Hack from the 70s Charlie ads! I decided to wear Infusion d'Iris today after watching your video. I actually love that weird opening!! But then I like that metallic note in Calandre, too. Daniela Andrier's aesthetic appeals to me: I wear Candy all winter, for instance. Every time I go to Sephora, which admittedly isn't often, I almost buy Infusion d'Homme. The Prada ambers are good, too. Hi Suzy Q - I like all the Prada ambers, too. I remember wearing Calandre as a teenager when I was too young for it. Those were the days before such things as Candy and all the other caramel-covered olfactory delights. Just discovered your videos and blog a week ago and I've been "listening" to it in the morning while I get ready for work. Thank you for the reviews and having so much fun with it. How did you become so educated in perfumery? Any suggestions for newbies like me in trying out new fragrances without getting overwhelmed? What are your go-to books? Hi JC - welcome aboard! I'm so happy you found me. For tips and newbie advice, check out my FAQ section. My go-to books are listed on the left sidebar under "read". Book-wise, I've also been loving Barbara Herman's Scent and Subversion. Look forward to smelling along with you. No, JC, you DO want to get overwhelmed! Thanks for the reminder, off to buy samples! I had this theory that vetiver has a marked presence in Infusion d'Iris: that the vetiver was responsible for its biting undertone that has one coming back for more. I compared it to Encre Noir and found them quite similar except that where EN's vetiver is accented with dark nutty woods (which also have a dry sharpness), IdI is rounded out with the said iris. In comparison Infusion d'Iris is quite floral and soft, and I think it complements the vetiver better (though of course the effect is very different at the same time). I have smelled Infusion d'Vetiver but only once (in an airport) and found it rather dull - but to have a very similar dominant note - the vetiver? I'v actually then been thinking of IdI as a vetiver perfume, but it is possible that I'm running together a much more complex accord of dry woods, vetiver and galbunum and simply not educated enough on individual notes to perceive this. Sometimes when I can't get a bead on a perfume, I do just what you describe: smell two different ones at the same time. Similarities and contrasts are heightened having both as a frame of reference. I've not taken the comparative analysis route with IdI, and haven't keyed in on the vetiver. My experience with it has been smelling it on a few different women I know well. This perfume has huge presence and a very persistent, hazy thickness. I find myself keying in on its prim-but-can-be-corrupted persona, thinking less about ingredient breakdown. Now you've given me the vetiver theory, so I'll bear that in mind when next I'm swamped by IdI.